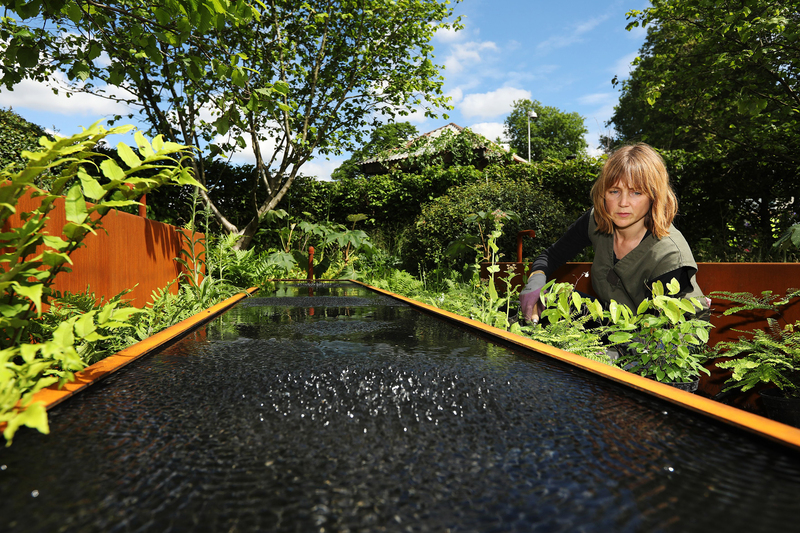 The Zoe Ball Listening Garden, designed by James Alexander Sinclair, aimed to break traditional gardening boundaries in 2017. Designed to replicate the feeling of being in close proximity to a speaker stack at a concert, the garden resonates deep notes through its gravel and water features, spurring patterns and movement amongst the green foliage. The garden constituted one of five new ‘BBC Radio 2 Feel Good Gardens’, which involved celebrities from the radio station aiding in each display. Three water troughs commanded the centre of the garden, with each fabricated by metal experts Barnshaws Section Benders. While usually associated with large scale construction projects, Barnshaws has a proven track record with regards to supplying highly specialised architectural fabrications of varying size. Recently this has included supplying curved steel for Corby’s Sundew Sculpture, Castle Bromwich’s Spitfire Island and Windsor’s Diamond Jubilee spheres. Fabrications contractor Project Fabrications contacted Barnshaws to supply 11 pressed Cor-Ten steel sheets to enable the construction of the water features based on this experience. Cor-Ten steel was specified due to its high corrosion resistance and aesthetic confluence with the rest of the garden. The 11 sheets specified were spread across 8 different dimensions, with Barnshaws press braking the sections to the required shape for the finished troughs. Barnshaws boasts one of the largest metal bending capacities in the world, so the project was easily accommodated. The finished sheets were delivered in time for installation before the show, a deadline that could not be missed. At the 2017 show, visitors were treated to patterned vibrations in the troughs, formed by the combined basslines of 50 years of Radio 2 music. Despite not being able to hear the music, the geometric shapes generated a lot of interest, with the garden really resonating with visitors. Photo Caption: Royal Horticultural Society planting team member Stephanie Marling puts the finishing touches to the Zoe Ball Listening Garden, supported with metal work from Barnshaws Section Benders. (Photo Courtesy of The Royal Horticultural Society and Luke MacGregor).